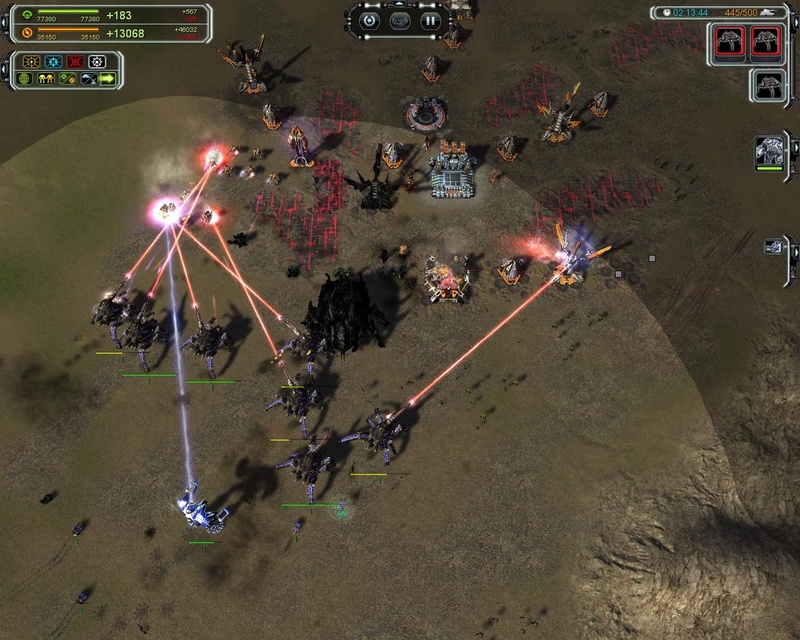 There are a lot of basic advances that Supreme Commander gave us that seemed to get completely ignored by subsequent strategy games. 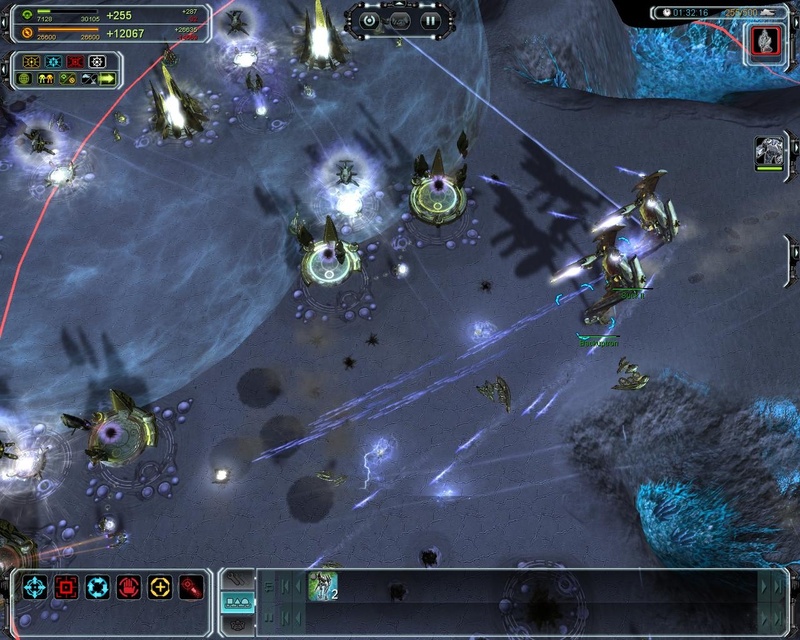 Maybe strategic zoom and actual projectile ballistics require a lot of extra performance pain, so I’m not expecting those to be everywhere (lovely as that would be), but the command queueing system is pretty much RTS control scheme perfection. 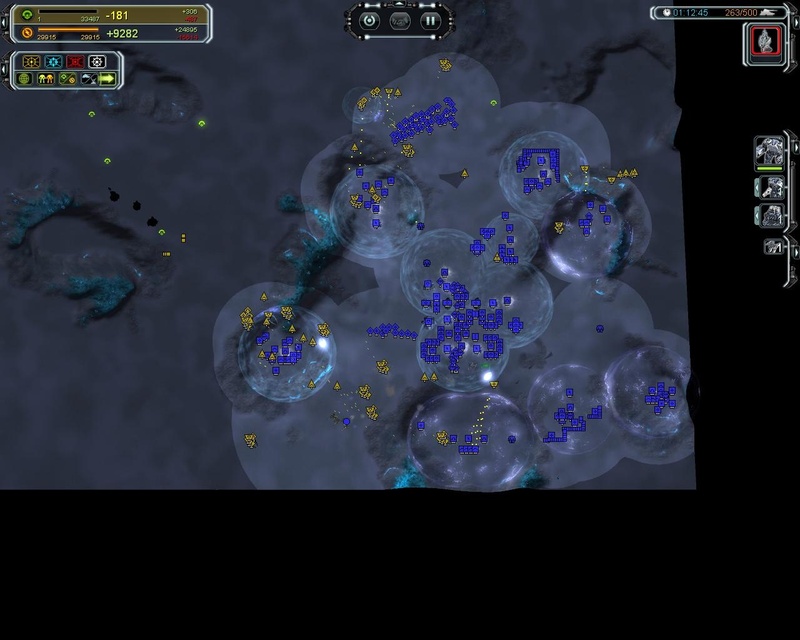 Then again, this is the world where people complained about Starcraft II allowing you to select multiple buildings. Maybe we’re willfully clinging to the past rather than just ignorant of the future. Less engaging is when it turns into a game of watching icons shoot icons at other icons. Where to even begin? Shift-clicking to queue up a sequence of commands is the oldest trick in the book, but SupCom takes it to a whole new level that leaves you wondering why nobody thought of it sooner. Holding down shift in general reveals all the queued orders currently in play — movement waypoints, building foundations, the lot. Moving patrol routes around is also a great thing. Hell, even being able to create patrol routes of more than two waypoints is great — guess what, most bases aren’t linear. It’s intuitive and natural to keep shift-clicking until you form a loop right back to the first waypoint and trust your troops run along it. Build all of your things, then steal engineers and build all of THEIR things too. Unit “assistance” mechanics are also pretty handy. Going back to Age of Empires II, in order to get a team of workers to build a structure you have to tell all of them at once. In SupCom, you can get five engineers working together by telling them all to assist one central unit — meaning you get all the benefits of faster construction without having to keep track of a horde builders. Or you can do it with factories, get one factory to help work through the build queue of another; again, you only need to keep track of one hub rather than juggle several different barracks. You can even get spare engineers to assist factories to get them to work faster, though that one’s maybe a bit thematically specific — buildings and robots are similar enough that applying more robots makes sense, but I don’t think adding an extra villager will help train a swordsman faster. 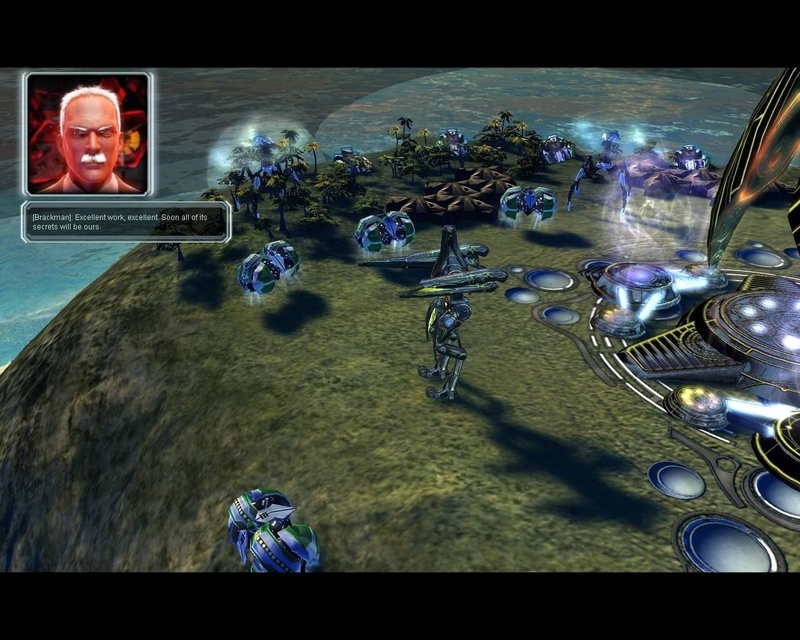 Although Supreme Commander does have a “massive” scale, I find it quite hard to relate to the scale. When I first heard about the game, I figured that there would be infantry as well as kaiju, some properly tiny ant-like soldiers to lend the end-game monsters some kind of context. Nope; the smallest units are already the sizes of houses. There’s a wrestling concept a friend of mine brings up every so often, “selling the move”. We know it’s choreographed and faked to eternity, but as long as the wrestlers act like it’s real we just don’t care. SupCom doesn’t sell the scale. The worlds, too, lack a lot of features to give them scale — beyond a few trees that are quickly crushed in battle or obliterated by nukes, they are smooth heightmaps. They look really impressive when you’re zoomed out to the max, but when you’re in closer they’re pretty bland. The dialogue ranges between “serviceable” and “hideous”. Design-wise, I came for the giant robots. The thing is, though, that most of the faction units aren’t robots. Indeed, every faction has a completely arbitrary mix of walkers and tanks. There doesn’t seem to be any rhyme or reason as to which units are wheeled and which walk; there’s no correlation between, say, movement speed and legs or anything like that. It’s just that some units are tanks and some are robots. Which is a bit crap. Tanks are boring — they’re basically blocks, floating along because they’re too small to even see their tracks moving. Speaking of scale again, buildings also tend to have lines of lights reminiscent of windows — but the lore states that there are no people inside, and the windows actually seem too small for people judging by the size of trees anyway. Hmm. I came for the epic battles, I stayed for the “Name Unit” function. The design really does start to really fall apart when the aliens come in, though. Don’t get me wrong, I absolutely adore the shiny silver and gold and the columns of bloom — it’s just that most of the units and structures are pretty badly put together. They’re formed of weirdly curvaceous obelisks with floating bits and it’s generally the floating bits that fall down. I mean, some elements work really nicely, like the airborne builders on factories that drift gently around the build pad as they work, and the tech 2 defence turrets that pivot on columns of solid light are really pretty. Other elements, though, like the tech 2 artillery, are messes of random floating chunks, while the giant robot Ythotha is so top- and forward-heavy that it loses all sense of physical plausibility. It also has some unnecessary random floaters around its face-laser. There’s a cohesive design around the textures, the odd curves and floating bits that does make everything feel alien, and that does work, but the subtler details often come across as a bit, well, sloppy. The main goal of the campaign is to capture a Seraphim engineer so you can play as them instead of your boring basic faction. It’s still pretty addictive and pretty, despite all that. 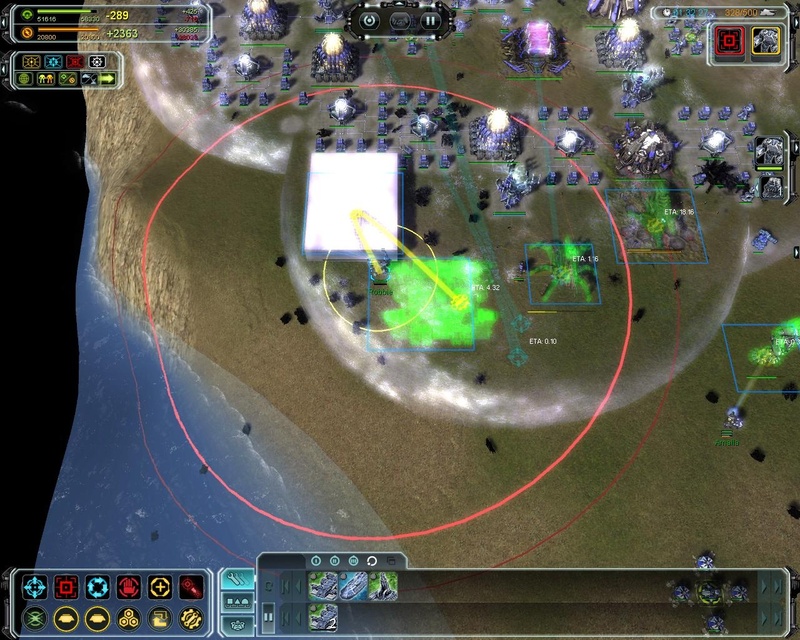 The campaign offers a fair challenge for something strategically inept like me and it is eminently satisfying to finally turtle up and start spewing out the massive experimental units that herald a game-ending steamroll. The narrative and lore is complete arse, though. I never particularly loved it the first time round, but damn, it’s bad. 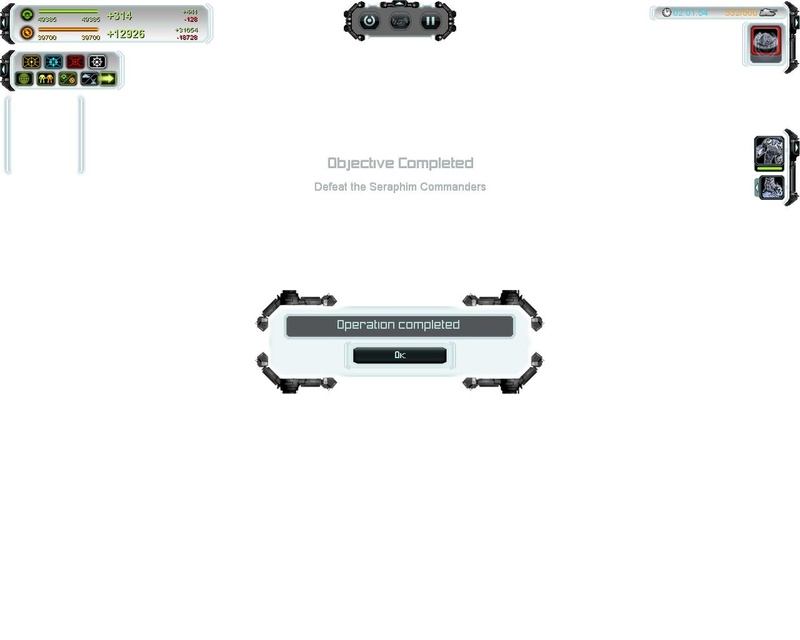 I do love how winning always results in a screen-obliterating explosion. 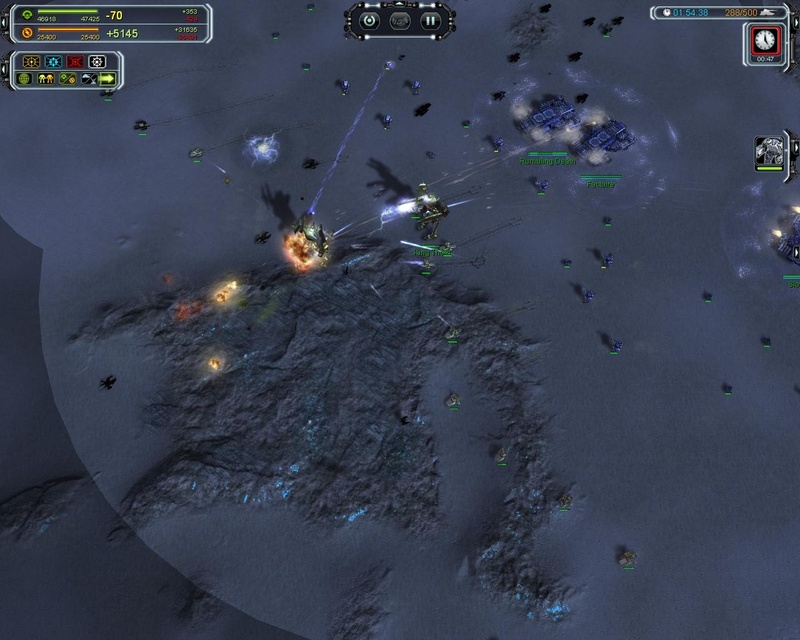 This entry was posted in Gaming and tagged Aeon, Cybran, facelaser, Forged Alliance, Gas Powered Games, Seraphim, Supreme Commander, UEF by Rao Dao Zao. Bookmark the permalink. If you place a unit/structure wrong you can click the bottom tab with the icon of you structure to cancel it . You just need to get used to the economy I can get to T2 in 8 minutes and T3 in 18/16 , you just need to know how to priorities and order your build Que . You can also reclame mass which helps lots . Use maths and you will rule at the game . Maths is boring. I came for the giant robots! For me there’s three major problems with this game. First, it’s too heavy for my laptop. Second, moving a lot of units will line them up. Third and most importantly: the economy has an insane growth curve that leads to micromaniging it having a bigger impact on the game than making valid strategical and tactical desicions and micromanaging your armies combined. Other than that, it’s a great game. Yeah, there’s one mission with valleys — send too many units “down the middle” and a good chunk of them on the wings will go back and around so they can get up top. Silly pathfinding algorithms! Also, yes, the economy is bonkers. Mass is so scarce at the early stages that it always takes ages to get off the ground (hence my constant rage at the inevitably pre-entrenched enemy who can hit you with T1 harassment off the bat, before you can defend yourself); then you get to Tech 3 and spam Mass Fabricators and you stop caring.